First Paragraph(s): When the city of Ember was just built and not yet inhabited, the chief builder and the assistant builder, both of them weary, sat down to speak of the future. What a rare treat this week's book is, Esteemed Reader. If you haven't read The City of Ember, drop whatever lesser book you're currently reading (unless it's mine) and pick up this one (or switch files in your ereader). I haven't been reviewing many books as of late due to my fiction workload, but I've been meaning to review The City of Ember for years as I consider it to be a modern classic and this seems like a good week to do it as author Jeanne DuPrau will be here to Thursday to face the 7 Questions ***does this-blog-rocks-so-hard happy dance***. In the city of Ember, the sky was always dark. The only light came from great flood lamps mounted on the buildings and at the tops of poles in the middle of the larger squares. When the lights were on, they cast a yellowish glow over the streets; people walking by threw long shadows that shortened and then stretched out again. When the lights were off, as they were between nine at night and six in the morning, the city was so dark that people might as well have been wearing blindfolds. Sometimes darkness fell in the middle of the day. The city of Ember was old, and everything in it, including the power lines, was in need of repair. So now and then the lights would flicker and go out. These were terrible moments for the people of Ember. As they came to a halt in the middle of the street or stood stock-still in their houses, afraid to move in the utter blackness, they were reminded of something they preferred not to think about: that someday the lights of the city might go out and never come back on. Grown people did their work, and younger people, until they reached the age of twelve, went to school. On the last day of their final year, which was called Assignment Day, they were given jobs to do. I'll tell you an open secret: middle grade readers dream of being given adult responsibility and obtaining adult autonomy and privilege, mostly because they haven't thought it through (suckers). Is it too late to let my parents pay the mortgage so I can read books all day? But I say this with the advantage of hindsight. I couldn't wait to grow up when I was the appropriate age for this story and starting my adult career at age 12 would've sounded like Heaven (does Ember have any openings for famous authors who spend their days autographing books and eating chocolate?). Unfortunately, the assignments are not given to our 12-year-old heroes by a wise and all-seeing wizard's hat, but appointed by a disinterested mayor who we'll learn later in the story is the last person who should be trusted with the future of young people. An arbitrary appointment might be an unpleasant one a 12-year-old could be saddled with for life. I might argue that's in some ways still fairer than our current real-life system of promising low-income kids they can grow up to be anything they want and then assuring them it's their character failure when they don't. But let's stick to the story. In The City of Ember, our heroine Lina Mayfleet has been stuck with an assignment of working in the Pipeworks, which is to say she's a plumber/sewer technician. Duprau uses this opportunity not to build the character of Lina, which she'll be doing for most of the novel's length, but to build the character of our secondary protagonist, Doon Harrow, who stands up Katniss-Everdeen style and volunteers to take Lina's position. With wrenches, hammers, washers, and black goop, they did this, getting soaked in the process. It took them most of the morning and proved to Doon that the city was in even worse shape than he’d suspected. Not only were the lights about to fail and the supplies about to run out, but the water system was breaking down. The whole city was crumbling, and what was anyone doing about it? All Doon’s life, his father had been saying to him, “You’re a good boy and a smart boy. You’ll do grand things someday, I know you will.” But Doon hadn’t done much that was grand so far. He ached to do something truly important, like finding the secret of electricity, and, as his father watched, be rewarded for his achievement. The size of the reward didn’t matter. A small certificate would do, or maybe a badge to sew on his jacket. “Maybe,” said his father, “you’ll find some interesting new bugs in the Pipeworks.” “Maybe,” said Doon. But to himself he said, No, that’s not enough. I can’t go plodding around the Pipeworks, stopping up leaks, looking for bugs, and pretending there’s no emergency. I have to find something important down there, something that’s going to help. I have to. I just have to. Some writers may not understand why Doon isn't the main hero, but not me. I'm the guy who wrote Banneker Bones and the Giant Robot Bees from the perspective not of the hero, but of the sidekick. I get it. Doon is a fine character, but he's more difficult to relate to than Lina Mayfleet. What would she draw? Taking hold of a pencil was like opening a tap inside her mind through which her imagination flowed. She could feel the pictures ready to come out. It was a sort of pressure, like water in a pipe. She always thought she would draw something wonderful, but what she actually drew never quite matched the feeling. It was like when she tried to tell a dream—the words never really captured how it felt. Lina is relatable not only because she has the capacity to imagine a world beyond the closed-off city of Ember, but because of the details of who she is. She may not be quite as passionate as Doon in his singular desire to heroically save the city, but she takes the same risks he does, and I say that makes her the same amount of hero. But Lina has a senile grandmother and a younger sister named Poppy to worry about. And what of her parents? I'm sorry, Esteemed Reader, is this your first middle grade novel:) Parents pose too many plot complications. Tragically, but also conveniently from a writer's perspective, Lina has been orphaned just as the best middle grade protagonists so often are. And I'm not one for spoilers, but don't get too attached to grandma. Later, in her bedroom, with Poppy asleep, she took the two colored pencils from her pocket. They were not quite as beautiful as they had been. When she held them, she remembered the powerful wanting she had felt in that dusty store, and the feeling of it was mixed up with fear and shame and darkness. As usual, I see we're running long, so it's about to time to call it a review. In summation, a great premise with an outstanding setting with the addition of well-developed characters make for a modern classic. Jeanne Duprau makes this look easy, but I know from experience that it's anything but. 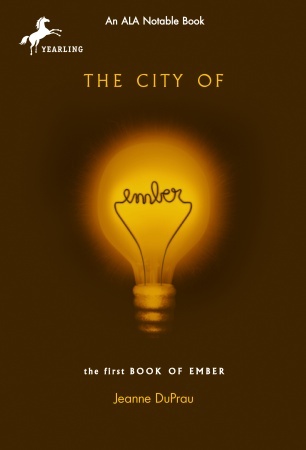 If you aspire to write great fiction (and what are you doing here otherwise) or if you're just looking for a great read, add The City of Ember to the top of your reading list. On the days when she’d come here with her father, Lina had spent hours wandering along the gravel paths that ran between the vegetable beds, sniffing the leaves, poking her fingers into the dirt, and learning to tell the plants apart by their look and smell. There were the beans and peas with their curly tendrils, the dark green spinach, the ruffled lettuce, and the hard, pale green cabbages, some of them as big as a newborn baby’s head. What she loved best was to rub the leaves of the tomato plant between her fingers and breathe in their pungent, powdery smell. He was a tall man, bald as a peeled potato, with a high forehead and a long chin. “How could we have seen anyone? The lights were out,” said Nammy Proggs, a tiny old woman whose back was so bent that she had to twist her head sideways to look up. It seemed to Lina that Lizzie was like a clock wound too tightly and running too fast. She’d always been a little this way, but today she was more so than ever. Her gaze skipped from one spot to another, her fingers twiddled with the edge of her shirt. She looked paler than usual, too. Her freckles stood out like little smudges of dirt on her nose. She set her pencil down for a moment and studied what she’d done. It was time to fill in the sky. In the pictures she’d done with regular pencils, the sky was its true color, black. But this time she made it blue, since she was using her blue pencil. Methodically, as Poppy scratched and scribbled beside her, Lina colored in the space above the buildings, her pencil moving back and forth in short lines, until the entire sky was blue. She sat back and looked at her picture. Wouldn’t it be strange, she thought, to have a blue sky? But she liked the way it looked. It would be beautiful—a blue sky.